KE00096 is a solid phase sandwich Enzyme Linked-Immuno-Sorbent Assay (Sandwich ELISA). 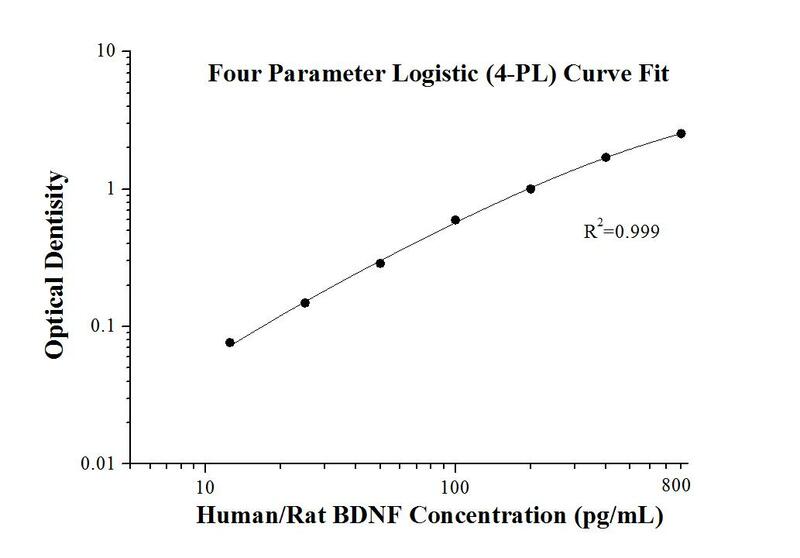 The BDNF ELISA kit is to be used to detect and quantify protein levels of endogenous BDNF. The assay recognizes human BDNF. A polyclonal antibody specific for BDNF has been pre-coated onto the microwells. The BDNF protein in samples is captured by the coated antibody after incubation. Following extensive washing, a monoclonal antibody of biotinylated specific for human BDNF is added to detect the captured human BDNF protein. For signal development, Streptavidin-HRP is added, followed by Tetramethyl-benzidine (TMB) reagent. Solution containing sulfuric acid is used to stop color development and the color intensity which is proportional to the quantity of bound protein is measurable at 450nm with the correction wavelength set at 630 nm. The brain-derived neurotrophic factor (BDNF), as a member of the neurotrophin family of growth factors, is broadly expressed in the central nervous system. BDNF is involved in cerebral morphogenesis, synaptic plasticity and learning, mental health, degenerative central nervous system (CNS) diseases, and energy metabolism. BDNF has recently been identified as one of the four major pharmaceutical targets in neuropsychiatric diseases, including depression and bipolar disorder. In addition, BDNF is increasingly considered as a potential therapeutic agent for neurodevelopmental disorders such as Rett syndrome.